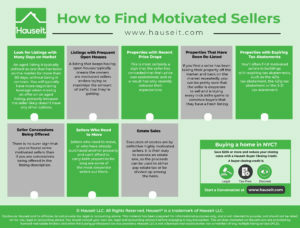 Learn how to find motivated sellers by learning all of the classic signals of seller desperation, such as having a listing with too many days on market, frequent open houses, recent prices drops, properties that are re-listed multiple times, buildings with expiring tax abatements, sellers who need to move, estate sales and sellers offering concessions on their listing description. An aged listing is typically defined as one that has been on the market for more than 90 days without being in contract. Aged listings are more prevalent during a slow market, otherwise known as a buyer’s market in real estate. For example, the average days on market to a signed contract in NYC is currently over 130 days, which is highly indicative of just how much New York City’s real estate market has slowed as of mid-2019. You will typically have more negotiating leverage when making an offer on an aged listing, primarily because the seller likely doesn’t have any other options. When you make an offer on an aged listing that’s still available, it’s very likely that you will be the only offer they have. As a result, you won’t have to deal with competitive pressure and can take your time to negotiate. Even better, you can make a lowball offer on multiple aged listings at the same time, and simply wait and see who wants to play ball! Pro Tip: Screen for aged listings that also have an open house posted, or a recent price change. That’s a sure sign that the listing is actually still available. Often times, an aged listing may not officially be in contract yet, but will not be available because a contract is close to being signed. A listing that keeps having open houses typically means the owners are motivated sellers and are trying to maximize the amount of traffic that they’re getting. Moreover, a listing that keeps having open houses means that the sellers probably haven’t received an offer that’s acceptable yet, and therefore the listing is still fully available. This is an especially strong signal that the property owners are motivated sellers if more than one open house is listed, and if there are multiple open houses listed for the same week. For example, if a listing has 3 open houses posted for Wednesday evening plus Saturday and Sunday afternoons, then the sellers are really eager or desperate to get more foot traffic in the door. Pro Tip: If a property has already received multiple offers that are at or above the asking price, it’s very unlikely that a listing agent will continue hosting multiple open houses a week. A listing agent will most certainly push back on such unreasonable behavior, as holding more open houses will likely be a waste of the agent’s time if the listing already has multiple solid offers. In such situations, a listing actually will hold a highest and best offer process and end showings after a winner has been selected. 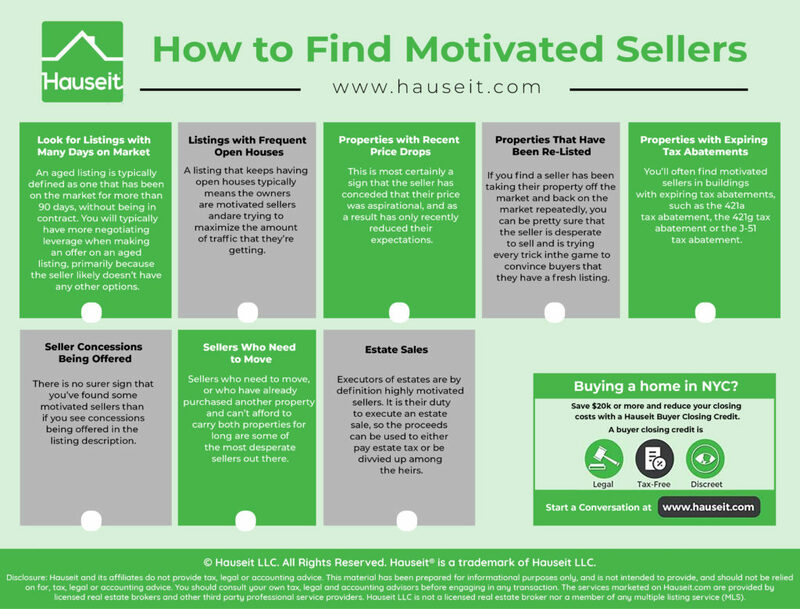 You can spot motivated sellers from a mile away if you see a listing that has a price drop, especially if the price drop comes after a long period of time on the market without going into contract. This is most certainly a sign that the seller has conceded that their price was aspirational, and as a result has only recently reduced their expectations. This is a really weak position to be in as the seller, as most buyer traffic for a listing comes in the initial few weeks when a listing is hot. As a result, the seller now will have a harder time finding a buyer, and if they do find one, it may very well be a vulture investor who knows that they are the only potential offer. If you wish to be that vulture investor, screen for listings that have many days on market, and that have recently had a price drop. The sellers will most likely be desperate at this point, and if you submit an offer, you’ll have enormous negotiating leverage as you will likely be the only option they have! Sellers often try to game the system by re-listing their property to make it appear as a fresh listing. They can do so using the same address; however, many public search sites will need a listing to be off market for at least 90 days before allowing the day count to reset. Alternatively, many sellers will try to confuse buyers by re-listing their property with a slightly different address. For example, they might list their apartment number as APT3A vs 3A, and many sites will take that to be a different unit within the building. As a buyer, you can easily detect these games by checking out the past sales and past sale attempts in the building. Many public search websites will list the sale history of all the units in the building, and you can see easily whether the seller has tried to sell and failed before, even under different iterations of their unit number. If you do find out that a seller has been taking their property off the market and back on the market repeatedly, you can be pretty sure that the seller is desperate to sell and is trying every trick in the game to convince buyers that they have a fresh listing. You’ll often find motivated sellers in buildings with expiring tax abatements, such as the 421a tax abatement, the 421g tax abatement or the J-51 tax abatement. Sometimes, these sellers simply aren’t prepared to pay the higher carrying costs associated with their apartment once these tax incentives expire. Other times, they’re simply scared that they will have an even harder time selling the apartment once headline property taxes are back to normal. As a result, sellers may be eager to pull the trigger and bail out of their property before property taxes go back to normal, higher levels. More specifically, you may see the sellers offer to cover some of the buyer’s closing costs, such as the NYC Mansion Tax, in the listing description. This is actually a pretty meaningful contribution and concession because the Mansion Tax is typically 1% of the consideration, for any deal worth $1 million or more. Pro Tip: Often times sellers won’t offer concessions directly on their listing description as that does make them appear weak and desperate. Instead, sellers will more commonly offer concessions such as paying for the buyer’s Mansion Tax privately, once the buyer has submitted an offer. Sellers who need to move, or who have already purchased another property and can’t afford to carry both properties for long are some of the most desperate sellers out there. 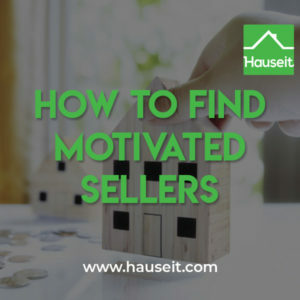 Some of the most motivated sellers you will find are those who have or are about to close on their new home, and need desperately to sell in order to procure enough funds to close on their purchase. At this point, any buyer who finds this out basically has the seller over a barrel. Furthermore, even if the seller can carry both properties for a while, most sellers will be desperate to offload their prior property as no one wants to pay carrying costs on an empty home. In this situation, each month that goes by without it being sold means thousands or even tens of thousands of dollars in wasted money for the seller. Executors of estates are by definition highly motivated sellers. It is their duty to execute an estate sale, so the proceeds can be used to either pay estate tax or be divvied up among the heirs. As a result, you know that the seller in an estate sale is for sure going to sell the property. As a result, you may have enormous negotiating leverage over the seller in such a situation if they’ve mispriced the property too high initially, and now are in a desperate position where they have an aged listing and must cut the price. In such a situation, not only do you know that they must sell, but also that they don’t have any other offers and that you may be the only interested buyer remaining. 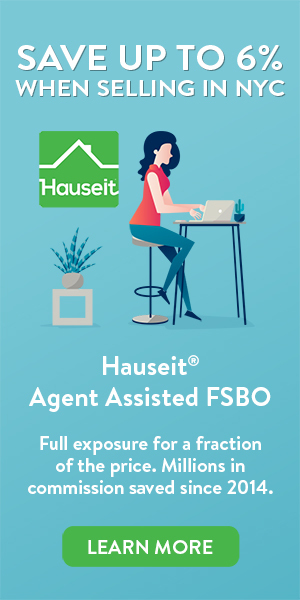 This is a fantastic position to be in as a buyer!